The Queen’s University Association, London (QUAL) held its Annual Lecture and President's Summer Drinks Reception at King's College London on the Strand on Monday 19 June 2017. The Annual Lecture – entitled 'Twenty-First-Century Terrorism: How Should We Respond?' – was given by the world-leading expert on terrorism, Professor Richard English, Queen’s Pro-Vice-Chancellor for Internationalisation and Engagement. The event, attended by almost 30 alumni and guests on what was a sultry summer evening in the capital, was hosted by Northern Ireland ex-pat and Queen's graduate Colonel Tim Collins OBE, Co-founder and Chairman of New Century, a leading provider of bespoke and cost-effective specialist police and military skills training worldwide. The arguments raised in his lecture by Professor English – all of which seemed even more relevant given the recent atrocities of Westminster Bridge, Manchester Arena, London Bridge/Borough Market and Finsbury Park Mosque – are set out in full, and on the basis of much first-hand material (including interviews), in his book Terrorism: How to Respond (Oxford University Press, 2009). 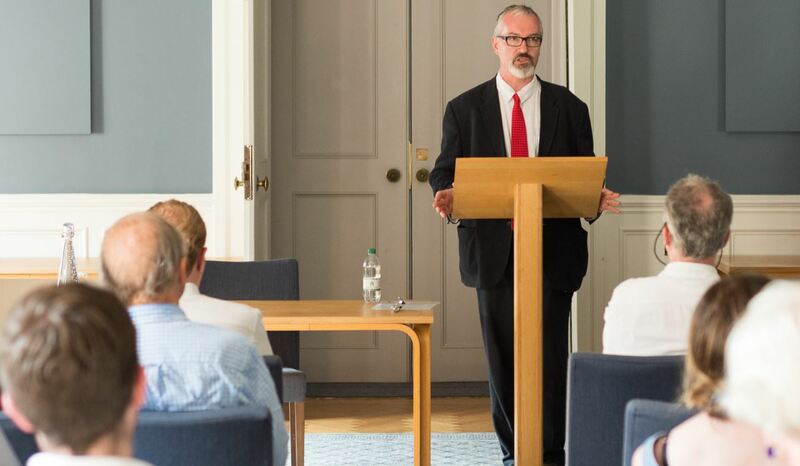 In what was a hugely stimulating talk, Professor English contended that the public needed to be dispassionate and to avoid being emotional about terrorism. While the State would outlive all terrorist groups, he suggested that people needed to be proportionate about terrorism, seeking to address the underlying root cause. He also reflected on the importance of not over militarising the response. Intelligence, he said, was the most vital element in seeking to counter terrorism with the interpretation of that intelligence being key. The importance of respecting orthodox legal frameworks, adhering to the democratically established rule of law and maintaining strong credibility in counter-terrorist public arguments were also explored. QUAL President Sean Rainey thanked Professor English and Colonel Collins for their time and support. He acknowledged the sad news of the passing of the former Vice-Chancellor, Professor Patrick Johnston and, on behalf of QUAL, sent condolences to his family circle, his friends, and to his colleagues at Queen’s. Sean Rainey closed the event by inviting members and their guests to the annual QUAL dinner on Wednesday November 15th when Baron Brian Kerr of Tonaghmore PC, QC, Justice of the Supreme Court of the United Kingdom and former Lord Chief Justice of Northern Ireland will share his thoughts and experiences at the impressive Law Society on Chancery Lane. For more on QUAL visit the Association website; general association inquiries should be addressed to Natasha Sharma, Alumni Relations Officer, Development and Alumni Relations Office; tel: +44 (0)28 9097 3135.